The "wall of separation" is the famous and contentious metaphor invoked by President Thomas Jefferson in his reply to a letter from the Baptists of Danbury, Conn. Like their colleagues in Massachusetts, the Connecticut Baptists were a minority in a state dominated by the Congregational Church. In their letter, the Baptists sought to congratulate the president on his electoral victory, chastise his critics and celebrate his commitment to religious liberty. 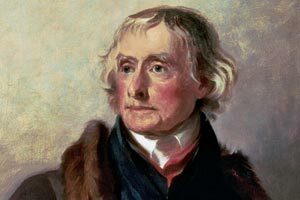 The letter had been sent in October 1801, but Jefferson did not receive it until the end of the year. He wished to reply at once. Anticipating that his reply would be widely published, Jefferson saw an opportunity to achieve three goals: to articulate important principles and influence public opinion; to justify his refusal to declare national days of fasting and thanksgiving; and to reassure his political supporters and his opponents that he was a friend, not a foe, of religion. By invoking the metaphor of a "wall of separation," Jefferson echoed the words of the Puritan dissident Roger Williams, who argued that the "garden" of the church must be protected from the "wilderness" of the world -- a world that could threaten the fragility and purity of the garden. In 1988, an FBI analysis of Jefferson's original draft showed that he had originally rendered the phrase "an eternal wall of separation." In both his draft and the final version, Jefferson used the word "church" rather than the broader term "religion." In so doing, he put the emphasis on the separation of political and ecclesiastical institutions. This would have appealed to religious dissenters like the Baptists, who were ardently opposed to established churches but believed that religion was essential to support the social order and political stability. Jefferson's metaphor lay largely ignored until 1947, when Supreme Court Justice Hugo Black invoked the phrase in Everson v. Board of Education and argued that the "wall of separation" must be kept "high and impregnable." Since then, no phrase has exerted a more profound influence on debates about the proper relation between church and state in America.